Cyient, a global provider of engineering, manufacturing, geospatial, network and operations management services to global industry leaders, announced that it has been conferred with the ‘Leaders in Corporate Innovation’ Award at the 13th Indo-American Corporate Excellence (IACE) Awards ceremony conducted by the Indo-American Chamber of Commerce (IACC). The ‘Leaders in Corporate Innovation’ Award recognizes businesses that have developed and employed innovative techniques for optimization of cost and operations. Cyient demonstrated excellence in all the parameters including promoting the concept of innovation among its associates and achieving business objectives. 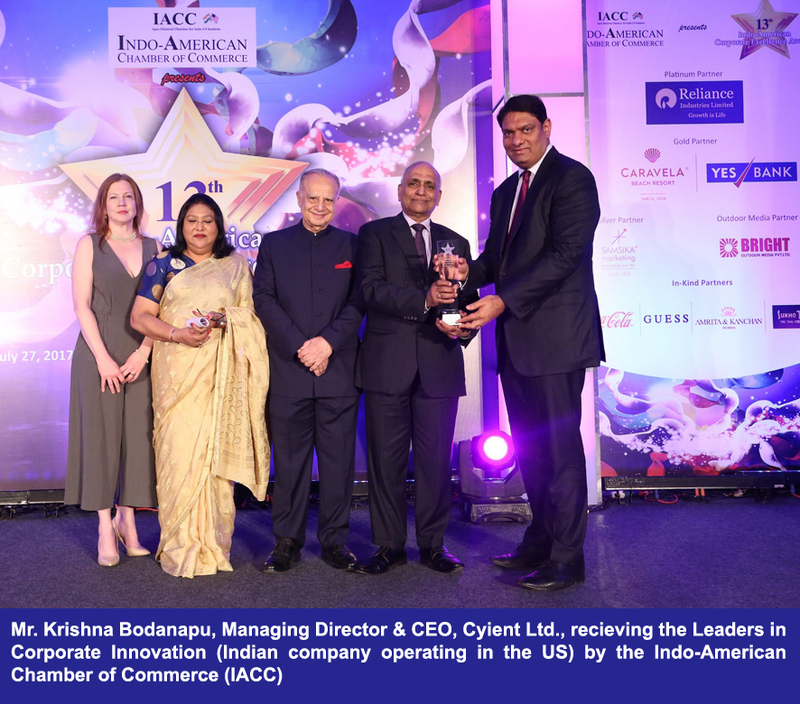 IACE Awards recognize organizations and individuals that embody the promotion of Indo-US Trade and have made outstanding contributions impacting all spheres of the corporate ecosystem – business, industry and the overall community. A distinguished independent jury, comprised of business and US Government leaders, evaluated the applicants and selected the awardees, who were honored in front of an audience of over 300 people, including the Indo-US business community, IACC members, US and other diplomatic officials. Started in 1968, by notable industry leaders and visionaries,, the IACC is the apex bilateral Chamber synergizing India-US economic engagement. Today, IACC consists of 2,400 members in 12 locations, representing cross sections of American. and Indian industries. The IACC organized the 13th edition of the Indo-American Corporate Excellence Awards in Mumbai. Through these Awards, the Chamber recognized the best Indian companies in the US and the best US companies in India.